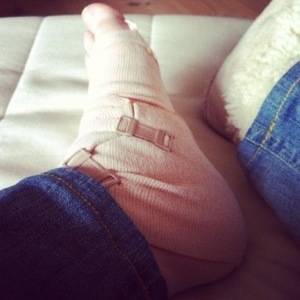 My mother found a bandage and Mathias helped me wrapping it around my foot. Didn’t help the pain of course but it’s much easier to keep the foot steady. I slept with the bandage all night long and I’m still wearing it. My foot isn’t hurting as bad this morning but it doesn’t feel good when I walk on it and I have to make careful movements because if I do something in a hurry I’m afraid it will hurt even more. A similar thing–weird sounds and then an aching foot–happened Thursday evening. Then I had both my feet on the ground but I must have done something wrong when I tried to fix the bed sheets before going to sleep. So I’ve had issues with this foot for quite some time and I’m doing exercises the physical therapist gave me but I’m worried it’s something else troubling my foot. I’ll call my doctor Monday and see what they think I should do. Maybe just go to the hospital and get it x-rayed. At this point I’m not sure it’s anything related to my RA or if something else have happened to my foot.